Bedroom vanity sets were used long before bathrooms were moved into the home and built-in bathroom cabinets and vanities became common. 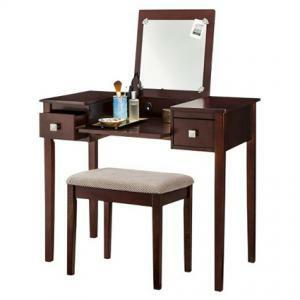 Vanity sets have always been a necessary part of most bedroom designs to provide space for daily grooming. A vanity set can be a very nice addition to almost any bedroom and in homes that don't have the floor space for a bathroom vanity, a necessary furniture addition. Consider a few different things before selecting a bedroom vanity set. There are all kinds of vanity styles on the market, from very minimalist to large substantial styles. The first thing to do is make sure your bedroom has enough floor space to accommodate a set in the first place. Then decide if you wish for a very large-sized vanity, moderate, or a bare minimal one to help narrow your choices for the area you've chosen. If you will be using the vanity set as your sole area for putting on makeup and styling your hair each day, then you will need ample storage space to accommodate the tools and grooming products necessary. If you have a well-lit bathroom space for this and will be using the vanity for touch-ups and nighttime preparations for sleep, then you may be able to use a set with just a table top surface and mirror, rather than one with multiple drawers and cabinets. While most bedrooms décors won't be ruined with a piece of furniture that isn't the exact same style, you may prefer to match this piece of furniture to the rest of the bedroom furniture. Highlight the vanity area with something that blends with your existing furniture style, whether you prefer a classic style, Victorian style, or even a country style. However, you aren't limited to maintaining the same furniture period or style. You may prefer to go with a completely retro look or a different finish from your existing furniture if that's what you truly desire. A vanity set will come with a bench, stool, or chair. If you feel you need back support, then a chair is a better option for you. However, the convenience of a bench or stool is that when not in use, it fits snuggly underneath the vanity - out of sight and out of the way. Target offers the Kayden vanity set in three color choices. This compact vanity and stool offers two side drawers for storage and a lift top mirror. Pros: Target customers commented that this vanity set is great for small or narrow spaces, easy to assemble, joints fight tightly together, and it's sturdy. Cons: A few Target customers commented that they received damaged products and had to return. One customer complained that after a year, the knobs became loose. Amazon sells the Furniture of America Doris 2-Piece Vanity and Stool Set. It is finished in a stunning black with brushed nickel handle, although white and espresso versions are also available. This vanity takes advantage of a three-side mirror and one center drawer. Pros: Amazon customers commented that the set is well made, easy to assemble, affordable, and the stool is comfortable. Cons: One Amazon customer complained she was unable to tighten the vanity legs and it was wobbly; another noted the wood scratches easily. Another Furniture of America find is the Matilda Chippendale Style Vanity and Stool Set, which includes a cherry finished vanity table, three-sided mirror, and stool. It is moderately-sized option that features five drawers with brass handles. Pros: Amazon customers commented that very little assembly is needed, excellent quality, drawers lined in velvet and the stool is sturdy. Cons: A couple customers from Amazon mentioned poor quality, and two customers complained the drawers were difficult to open. Shopping sometimes involves picking out a stool separately from your set, depending on your needs, or picking one out from a furniture store so it matches the rest of your bedroom. Selecting a vanity stool, bench, or chair is a personal choice. Most sets come with one of these, but in some cases you have the option of choosing. Don't forget that many come with rollers and you must decide whether it's right for you. It might be a good idea if you want to be able to get closer and further to the mirror with little effort, but a bad idea if you want a stationary seat. Touch of Class offers a wide selection of vanity stools available with or without rollers and at all prices. If you prefer a high back, full pleated skirt stool with easy-rolling casters, then Frontgate's Sabrina vanity stool is your ideal find. Incorporating a vanity into an existing bedroom décor doesn't need to be difficult especially when you shop at a furniture store. 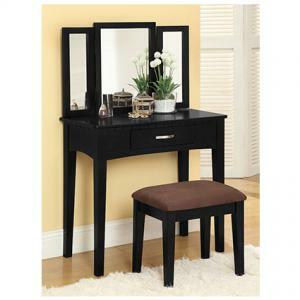 For example, Wayfair offers a large selection of furniture style vanity sets. You should be able to find the perfect vanity to go with your bedroom furniture style through most furniture or home stores, whether shopping at an online store or at a retail location in your town. Sometimes, people make the mistake of simply adding a vanity set to the bedroom, placing it in a corner out of the way. While this works from a purely utilitarian point of view, you may wish to add one with more style. Will you be using the vanity in the mornings? If so, you may want to position the furniture as close to a window to take advantage of the natural lighting. If privacy isn't a factor, then use the screen as part of the overall room design, placing it in the corner behind the vanity. Add the floor lamp in front of it, or smaller task or table lamp. Treat the vanity area as you would any other part of your bedroom décor and design. A floor lamp can be used in place of a table lamp. You can then decorate the corner space the screen has created with a false wall. Add a task light for direct lighting, and place photos and artwork on the walls. The screen and added lighting can afford you the opportunity to create a private dressing room within the bedroom. Making space for your personal grooming station is something you will appreciate every day as you prepare for work or play. Ensure you make the right selection for your bedroom décor by taking time to shop around and discover what is available.